The Big Superdry Festival Fashion Competition! Heading to a festival this summer? Whether you’re heading off to a massive music event or just bopping along to summer beats in the garden, you can’t beat that festival look this season. That’s why we are working in collaboration with Superdry to give you the opportunity to win a fantastic range of prizes in this festival inspired competition! * Exclusive Personal Styling Appointment at the Superdry Premium Lounge! 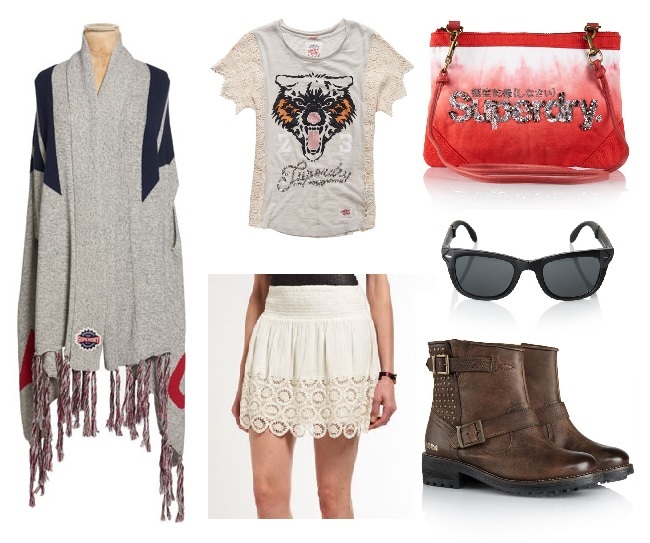 * Superdry Outfit worth up to £500! * Take over Superdry’s official Pinterest account for a day! * Blog takeover – Create your own blog post to be exclusively featured on the Superdry blog! And FOUR Runners Up will each win the T-shirt they have selected in their competition entry post! 1. Create a blog post styling a Festival look using a Superdry t-shirt and other Superdry products from the online store, here's one I made earlier (that tee though - swoon!) . . .
2. Include a link to this competition post in your entry. 4. The competition ends on the September 2nd 2015 at 23.59. There will be one winner and four runners up. The lucky winners will be chosen by us and Superdry. Winners will be chosen based on their style, originality and the overall festival feeling of their blog post. This will not be a random selection contest so give us your all! Good luck guys, we can't wait to see your fab festival inspired entries! 1) The promotion is open to UK residents ("Entrants"), excluding employees of the "Promoter", their families and anyone professionally connected with the promotion. 2) All entry instructions on The Style Rawr blog (the "Page") form part of these terms and conditions ("Terms"). By entering this promotion, all participants will be deemed to have accepted and be bound by the Terms. The Promoter reserves the right to amend these Terms, and any such amendments shall be published on the Page. 3) Entrants may enter once and must be aged 13 or over. 5) If for any reason a winner does not reply to their message within seven days the Promoter will select a new winner. 6) The Promoter may in its absolute discretion disqualify any entries that it feels do not comply with these terms and conditions or where any form of bad faith is suspected. 7) The entry must be submitted personally by the entrant. Entries by 3rd parties, collective entries or multiple entries will be disqualified. 8) The Promoter accepts no responsibility for lost or incomplete entries. 9) The promoter's decision is final, and no correspondence will be entered into. 10) Upon request, the surname and county of the winner will be available by sending an SAE to Festival Fashion Blogger Competition, Superdry Plc., 60, Unit, 2C The Runnings, Cheltenham, Gloucestershire GL51 9NW . Such requests should not be sent until 28 days after the selection of the winner. 12) English law applies to these terms and conditions. 13) Price of goods package taken from RRP valid as of 05/08/15.